(About) General Lee and his Confederate officers in their first meeting since Appomattox, taken at White Sulphur Springs, West Virginia, in August 1869, where they met to discuss "the orphaned children of the Lost Cause". 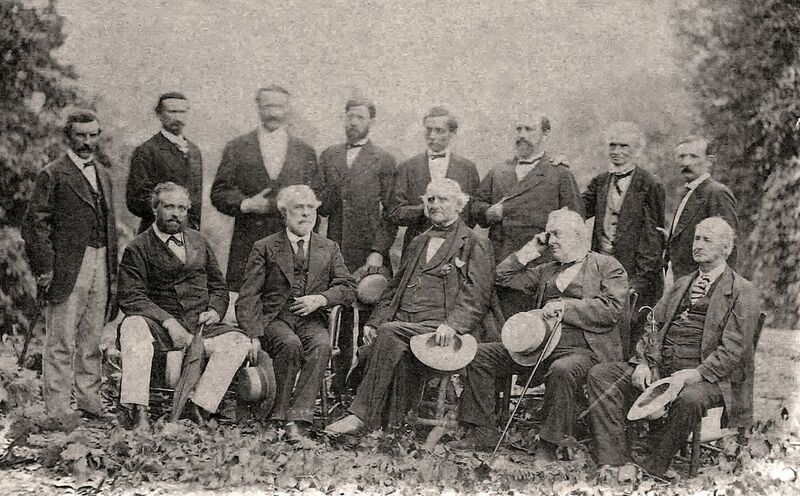 Whether during or after the Civil War, this is the only photo of Lee with his Generals in existence. Left to right standing: General James Conner, General Martin Witherspoon Gary, General John B. Magruder, General Robert D. Lilley, General P. G. T. Beauregard, General Alexander Lawton, General Henry A. Wise, General Joseph Lancaster Brent Left to right seated: Blacque Bey (Turkish Minister to the United States), General Robert E. Lee, Philanthropist George Peabody, Philanthropist William Wilson Corcoran, James Lyons (Virginia). A field officer in the Civil War army was typically a major, lieutenant colonel, or a colonel. The rank is senior to the company grades but is junior to the general ranks. Because the field officers led the troops directly into the heat of the battle, known as the thick of the fight, they sustained high casualty rates. The infantry regiment was commanded by Colonel William Holland Thomas, Lieutenant Colonel James R. Love II, and Major (promoted to Lieutenant Colonel in October 1864) William Stringfield. Its cavalry battalion was under the command of Lieutenant Colonels James A. McKamy (captured by General George Custer in the Third Battle Winchester Virginia) and William C. Walker. During the conflict, the unit served with numerous corps, division, and brigade generals. Colonel William Holland Thomas was the commanding colonel of the Thomas Legion, personally recruited the Cherokee Battalion and Cherokee Life Guard (Bodyguards), was the only white man to have ever served as a Cherokee chief. He was also cousin to Zachary Taylor, the twelfth President of the United States, President Zachary Taylor. Lt. Col. William C. Walker had prior service in the 29th North Carolina Infantry Regiment. While at home in January 1864, he was awakened and murdered by outlaws. Lt. Col. William Stringfield initially served as a private in the 1st (Carter's) Tennessee Cavalry Regiment and then as a captain in Company E, 39th (William M. Bradford's) Tennessee Regiment (aka 31st Tennessee Infantry). He was elected as a member of the North Carolina Legislature in 1882-1883 and to the North Carolina State Senate in 1901 and 1905. He married Thomas's sister-in-law Maria Love, and died from natural causes on March 6, 1923. Lt. Col. James Robert Love II initially served as a Captain in the 16th North Carolina Infantry and fought bravely in the battles of Seven Pines, Antietam, Seven Days Battles around Richmond, and Second Bull Run. He was wounded in the Battle of Seven Pines. While in Virginia, he saw the "Elephant" and served under Generals "Stonewall" Jackson and Robert E. Lee. Love was first cousin to Sallie Love, the wife of William Thomas. He was a graduate of Emory and Henry College, studied law, and was a member of the North Carolina Legislature. After the war, he was a member of the North Carolina Constitutional Convention in 1868 and served in the State Senate. Waynesville, North Carolina, was founded by his grandfather Robert Love. Love died on November 10, 1885.